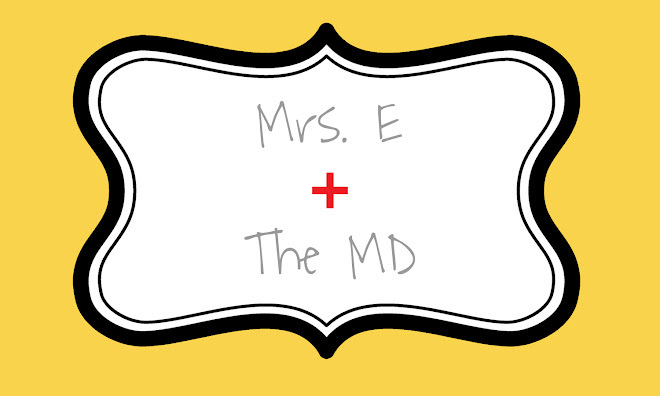 Mrs. E and the MD: What a Week! Well, after all the snow we got last Friday, Monday night delivered us even more snow and drifting, which spilled over into Tuesday and Wednesday, thus causing us not to have school SINCE Monday (which was delayed anyway!). As fun as snow days are, they are truly not fun when you have to make them up at the end of the year, which means that originally getting out the week before Memorial Day has been tossed out the window. I believe we are now going until the Thursday after Memorial Day weekend. I am really sad about this because this is time that I would have had with my baby. I think the most frustrating part is you can't control the weather, no matter how much you want to...so I have tried to make the most of the time off. Tuesday, I cleaned ALL day. I did so much laundry, washed more baby stuff, cleaned the entire kitchen from top to bottom, removed a lot (A LOT LOT LOT LOT) of cobwebs, organized our linen closet, deep cleaned both of our bathrooms (even washed the shower curtain), cleaned the inside of the fridge (which was sick), cleaned under the couch cushions (lots of treasures there), dusted, and got rid of a lot of trash/magazines/junk. It felt great to do this. Call it what you wish-- nesting or not-- I just really love knowing that my house is clean. I know we are going to have a lot of people in and out of our house when the baby comes, so I don't want to be embarrassed by a dirty house! Wednesday, I was really knocked out from all the hard work the day before, so I didn't do much. I napped for about an hour, showered, ate lunch, and then went to my doctor's appointment. Thursday, today, we are closed AGAIN. I have a feeling we will be back in school tomorrow on delay, so I am going to grade the mound of papers I have been putting off grading, clean out my car, install the car seat, and then maybe go out and have a little fun shopping with my imaginary money. We have done a lot of work in the nursery, and I have been trying to post pictures on my blog for like a week, but it hasn't been letting me! I will try again soon!